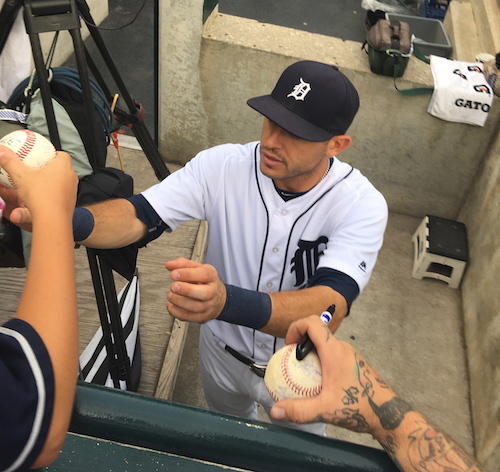 Here is an original photo of Tigers second baseman Ian Kinsler signing autographs at Comerica Park in downtown Detroit. The shot was provided by Lance Martinez of My Detroit Sports. Kinsler spent the first eight years of his career in Texas, before joining the Tigers in 2013, as part of the blockbuster trade that sent Prince Fielder to the Rangers. The Arizona native is a four-time All-Star and has always possessed good power for a second baseman, belting 209 career home runs from the often weaker hitting position. This season, the 34-year-old has posted 25 big flies and 72 RBI for the 75-63 Tigers, who are currently one game out of the second American League wild card spot. Tigers fans can also view other behind the scenes original stories, chronicling Kinsler and the team, during the past few years.